Visual signal a universal language and it has great potential and power. With the lack of resources becoming increasingly global, an innovative way to communicate across languages and species becomes very important. For that purpose, our team comes up with a concept that to use bioluminescence as a tool to transfer information and data. This visual signal can be modified by temperature, pressure, etc. To communicate under various environments and situations and even cross species. The visual signal for emergency rescue will likely become available five to ten years from now. 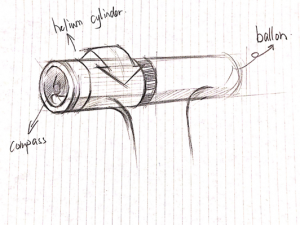 In this project, our team will develop a wearable device and in the emergency situation, this device will send a balloon into the sky to send the signal. By hiking at night people are unconsciously reducing their ability to use the vision to navigate, injury and loss the way occurs frequently. The rescue team may need to use a long time to find them due to the lack of signal. Therefore, how to send the SOS signal efficiently and how to improve the rescued rate for people is our mission. In that case, our scenario is the after-dark adventure and our target user is those who like hiking and climbing. The Emergency Balloon uses cell-free protein synthesis (CFPS) and nanocapsules. 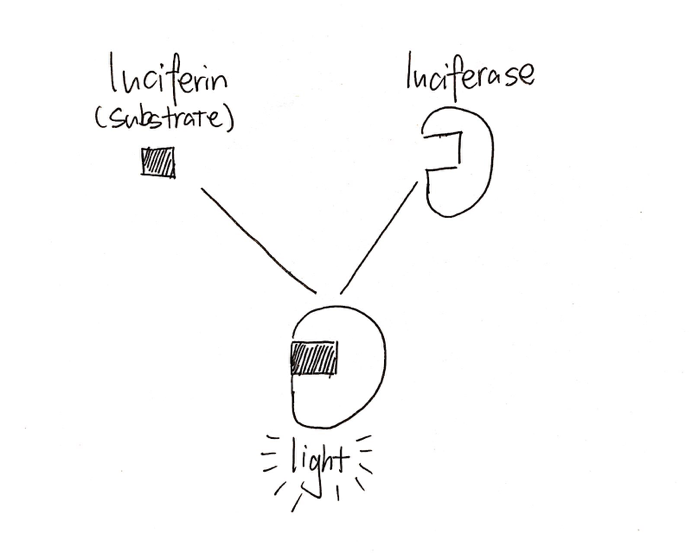 Luciferase and luciferin (figure1) are the enzyme and the substrate necessary for bioluminescence. We have employed NanoLuc luciferase and luciferin, the newest improved version of the enzyme-substrate complex. NanoLuc has significantly improved brightness and stability compared to other sources such as Firefly and Renilla. They are encapsulated in separate nanocapsules to prevent their untimely interaction. Furthermore, we will use the PURE system (a synthetic biology kit) with DNA templates coding for NanoLuc luciferase and luciferin for CFPS. Transcription factors are entrapped in nanocapsules as well but the rest of the PURE system(figure 2,3) is free. 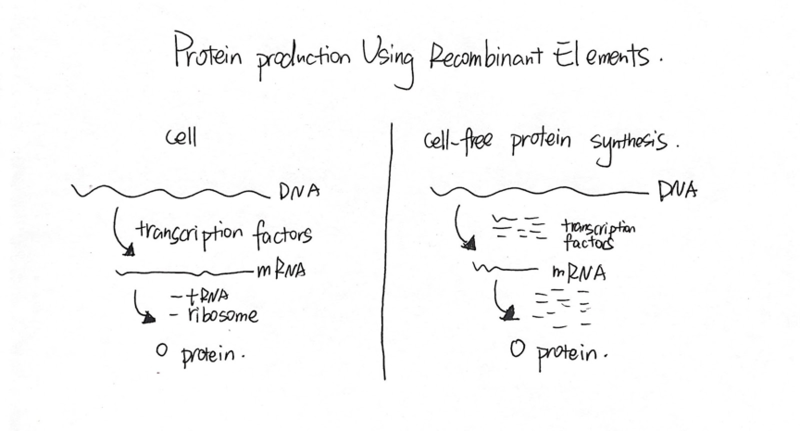 This prevents the activation of transcription and thus the PURE system. Everything is placed in the non-inflated version of the balloon. Enscapsulin nanocompartments are a spherical group of proteins that are used by bacteria to sequester compounds that are dangerous to the bacterium. 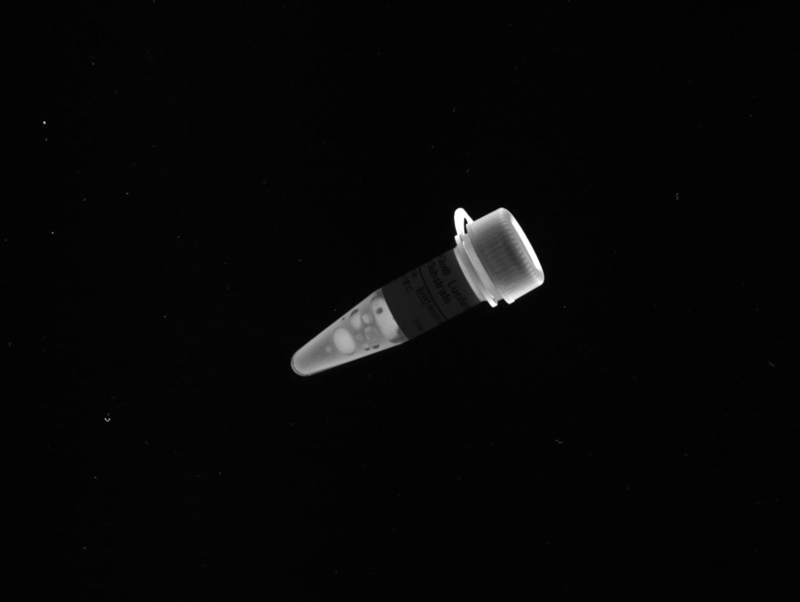 These capsules (figure 4) may be grown in cyanobacteria or plants and can be engineered to encapsulate almost any protein via a simple expression of the target protein gene next to the encapsulin gene in a sequence. Luciferase and Luciferin will dormant continuously in the ballon, unless user opens the helium cylinder and then materials will be activated by the huge pressure. The Biotechnology mentioned above was tested successfully in the lab, which proved the feasibility. 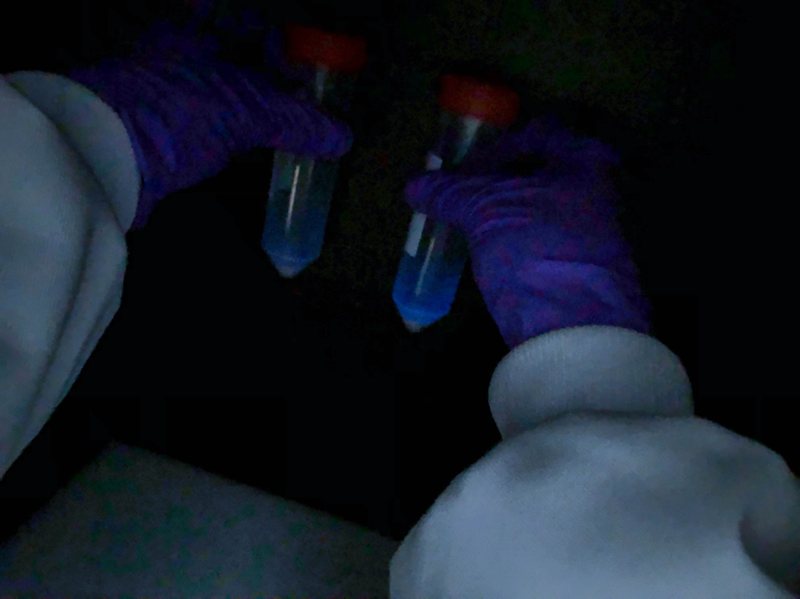 The following pictures (figure 5, 6) are parts of our prototype, as we can see they emit blue light. 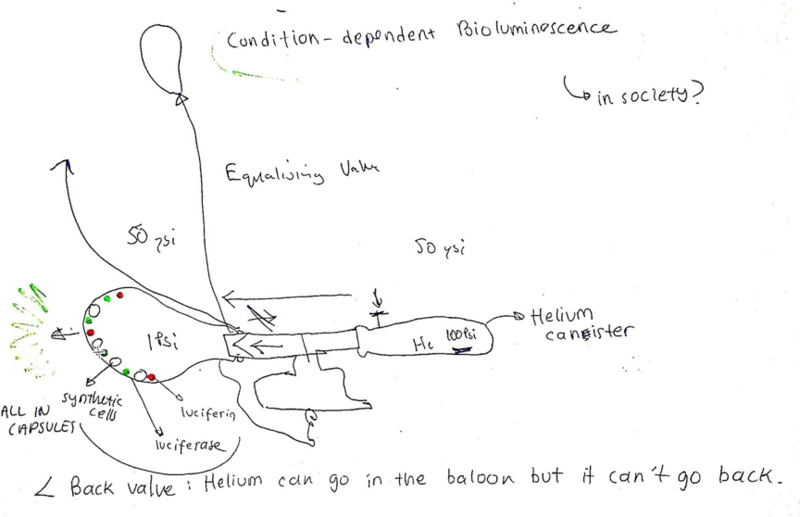 The diagram ( figure 7) shows how the balloon, attached to a helium canister contains. 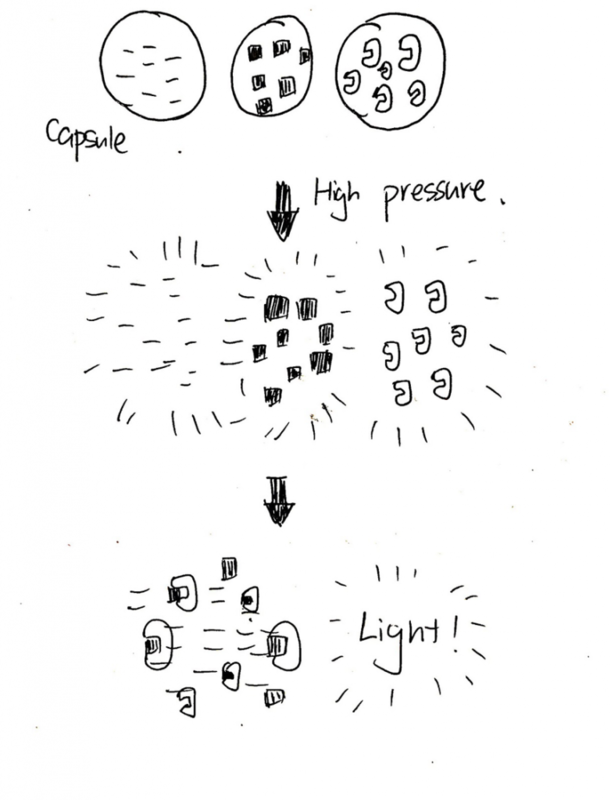 Upon release of the helium, the capsules will break and the luminescent process may begin. The back value will be used in this device to ensure that the helium can go in the balloon but it cannot go back. 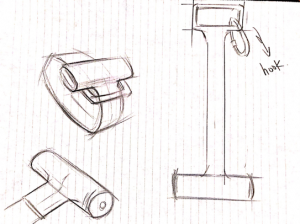 We used 3D printing technology to develop our first band (figure 8, 9) based on our sketch (figure 10, 11). The device can be stretched and it has a hook which can be attached on a belt or backpack. 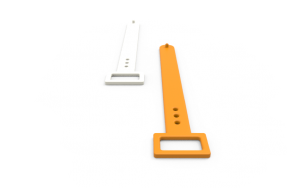 For water sport, the device can be rolled as the watch or band, because it will be no space for the hook. 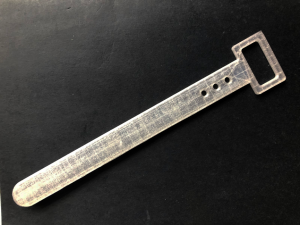 The shape of our band probably has potentially negative effects, therefore we use the flexible filament to develop it in order to mitigate the risk. Rampioni, Giordano, and Francesca D’Angelo. “Synthetic Cells Produce a Quorum Sensing Chemical Signal Perceived by Pseudomonas aeruginosa.”, Royal Society of Chemistry, ChemComm, vol. 54, Feb. 2018, pp. 2090–2095. Rampioni, Giordano, and Francesca D’Angelo. “Synthetic Cells Produce a Quorum Sensing Chemical Signal Perceived by Pseudomonas aeruginosa.” ChemComm, vol. 54, Feb. 2018, pp. 2090–2095. Royal Society of Chemistry, doi:10.1039/c7cc09678j. Jones, K.A. et al., 2017. Orthogonal Luciferase-Luciferin Pairs for Bioluminescence Imaging. Journal of the American Chemical Society, 139(6), pp.2351–2358. Mavelli, F., Marangoni, R. & Stano, P., 2015. A Simple Protein Synthesis Model for the PURE System Operation. Bulletin of Mathematical Biology, 77(6), pp.1185–1212. Previous PostSelf-healing fabric…. a second skin?